This is a view from my office today. The weather is just gorgeous out so it's high time I grade the driveway. Whoa...what a bumpy business after seven months or so of zero attention. I hauled out my backpack sprayer today also. This is the perfect time of year when the days are nice and warm but the daylilies haven't started growing yet to spray all the weeds with something...take that weeds! ​I'm packed and ready to head out to the Region 2 Winter Meeting in Brookfield, Wisconsin. Looking forward to a weekend full of daylilies. Boy ...am I needing a fix. I miss 'em! Hope to see you there! Uugh. I just knew it. This blogging thing just doesn't come easy for me. In this day and age you might find it hard to believe but not all American's have good internet service at their homes! Yes... that would be us. Our property is bordered by state land AND county land....so no real urgency for a tower to be placed out in the boonies I suppose. Oh well...I promise to keep blogging from the local grocery store parking lot in town! It's February 29th...an extra day. That's it! I've got this whole day to do whatever I want cuz it's a freebie right?? So I'll blog. The summer of 2017 holds something I've never done or been a part of before. It's causing me to lose a bit of sleep. The Region 2 Summer Meeting is being held in western Michigan. Uh huh....that's my neck of the woods. Our garden will be one of the stops along that journey. I'm excited and terrified all at the same time. Lots to do...fences to replace, fences to paint, fences to build. Daylilies to weed, daylilies to plant, daylilies to cull. All will get done, I know it will. Those are the things that are necessary and somewhat simple. But it's the little things like....should we have belly dancers in the gardens that day? Should we have a small animal petting zoo available? Should we offer oil changes for those who drive in from afar? 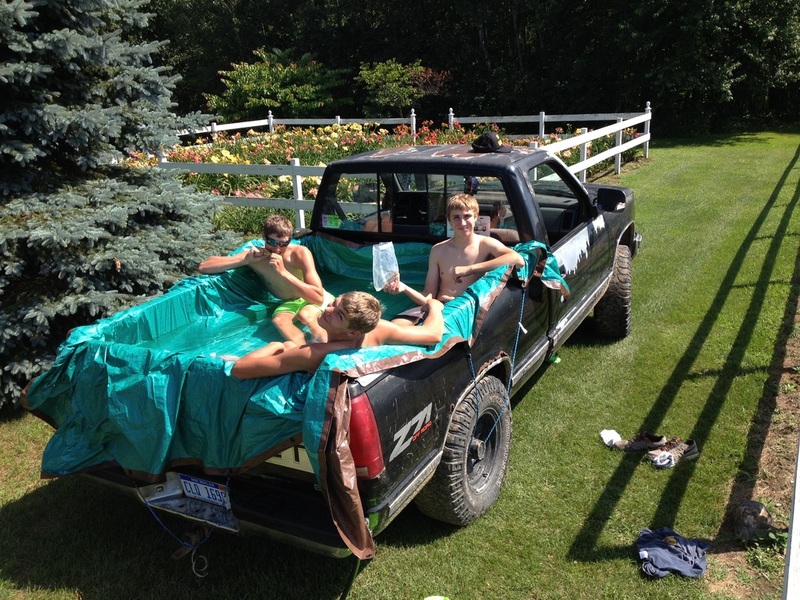 Should I ask my boys to park their "redneck swimming pool" out of sight? What do I feed my dog that week to assure the visitors that she won't have gas so bad that she could kill a small farm animal? All these things are fun and some are even alarming....but are they deal breakers? Maybe so. :) Now do you understand my reasons for no sleep? Just know that when and if you are able to attend you will get a small glimpse of "home at the McMahon's". We aren't fancy, over-the-top people. We just want you to feel comfortable when you come to our gardens. Spring is coming quickly and I'm geeked to see what may bloom in the seedling field this summer. Those are the surprises I love! 'Til then...I hope to see y'all in Wisconsin in March for the Region 2 Winter Meeting!!!! And if you can make it up in 2017...pack your swimming trunks!! Well...this is a first. Me blogging! Didn't see this happening ever! After about a hundred nudges from daylily folks asking me to start a blog on my site I'm doing it! Whoa...wish me luck! Last week I officially finished up in the garden. Well...I said that two weeks ago but found myself out there again this past week finding odd jobs that needed to be done before the snow flies! All of the seedlings that were tagged this summer in my seedling field are moved into the 'keeper' area which I call the "Bull Pen". Only the prize bull gets a special place to reside right?! I believe I moved about 35 seedlings into this garden for further evaluation. The Bull Pen also holds my future introductions and those still being considered. This is the first area that gets weeded in the spring and the last to be left alone in the fall. It is my 40' X 40' little square of heaven. There are four wide rows of flowers within the Bull Pen. The colors during peak bloom range everywhere from the cleanest, creamy white to the most inky, deep, deep purples. I find that the pathways don't need much weeding as I tend to pace up and down them trying to make decisions on who gets introduced, who merits being lined out yet another year and that dreaded decision of (insert whispering here) who goes to live in that special place behind the barn. Y'all know what I'm talking about. I've been at this hybridizing gig for almost 14 years and found it hard to organize at times. Where to hold plants over while evaluating was tricky! I didn't want them to get 'lost in the crowd' so to speak so Ed and I put in this simple garden. It has been the perfect solution to keeping special daylilies right at my finger tips! The Bull Pen is the first place I head to on any given July morning to see which daylilies are showing off. Daylily hybridizer in Hamilton, Michigan.